Boy Scout Troop 33 helped clean up tornado debris in a wooded area on Wheeler Road northwest of Kirkland. Downed trees became neat stacks of wood and brush piles. Their hard work made a visible difference. Recovery from the April 9 tornado that ravaged parts of Ogle and DeKalb counties will require a community effort. 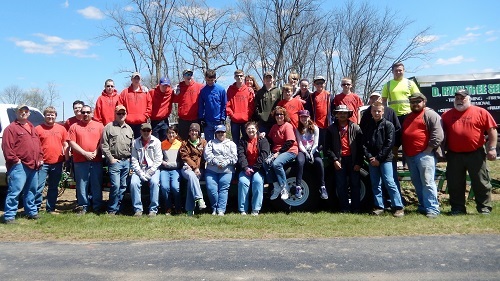 DeKalb’s Boy Scout Troop 33 has worked on two projects in both Ogle and DeKalb counties. Their first relief project took place April 12 within 72 hours of the disaster. The Schabacker farm on Hemstock Road northwest of Rochelle was directly hit by the tornado, leveling all the barns, destroying everything but the farmhouse. It had been farmed by generations of the same family since 1863. The power of the tornado scattered debris from damaged homes immediately south of the farm covering its acreage. Fields were covered with rafters, beams, roofing and just about anything else you can imagine. With the owner’s permission, Scouts worked on the property walking fields and removing debris. More than a hundred other volunteer workers also removed debris that day. It was a project immediately crucial before any planting could be done. Scouts worked on an area covering 140 acres. As they walked the fields they found and collected all sorts of debris which were placed together in large piles. Some items were extremely large and heavy. Some had to be pried back and forth and pulled out of the ground. Tractors pulled hay wagons to load and carry the debris away to a central location and then to a landfill. The debris collected filled several hay wagons. Troop 33’s second project took place northwest of Kirkland on Wheeler Road where a wooded property lost more than 300 trees downed by the tornado. There to help clear downed trees, adults manned chain saws, older Scouts used hand saws, while younger Scouts carried wood. From the downed trees, stacks of cut wood and brush piles were created. D Ryan Tree Service donated a Bobcat and operator to move giant logs. Hard work made a visible difference. Recovery from the tornado will involve so much more. There are more fields to walk, more debris to remove and so many more downed trees to clear. There are donated items to be sorted, hundreds of young trees to plant and so much money needs to be raised. Community groups and individual volunteers are needed. Long Term Recovery requires a community effort. Those with interest or questions about what they can do should call the Volunteer Hotline at 815-762-8653. Individuals and groups interested in volunteering can fill out volunteer forms at http://villageofkirkland.com/2015/04/tornado-recovery-information-volunteers/.